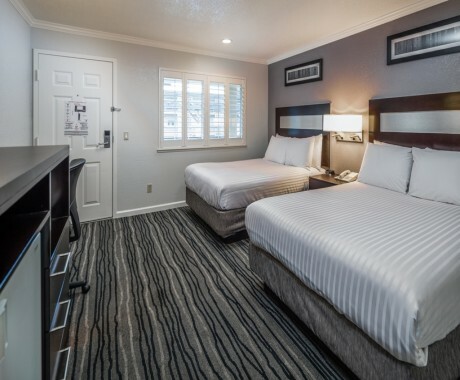 The Redwood Creek Inn in Redwood City has a 48 hour Cancellation Policy whereby it is required to cancel at least 2 days prior to your arrival date by 3 PM. 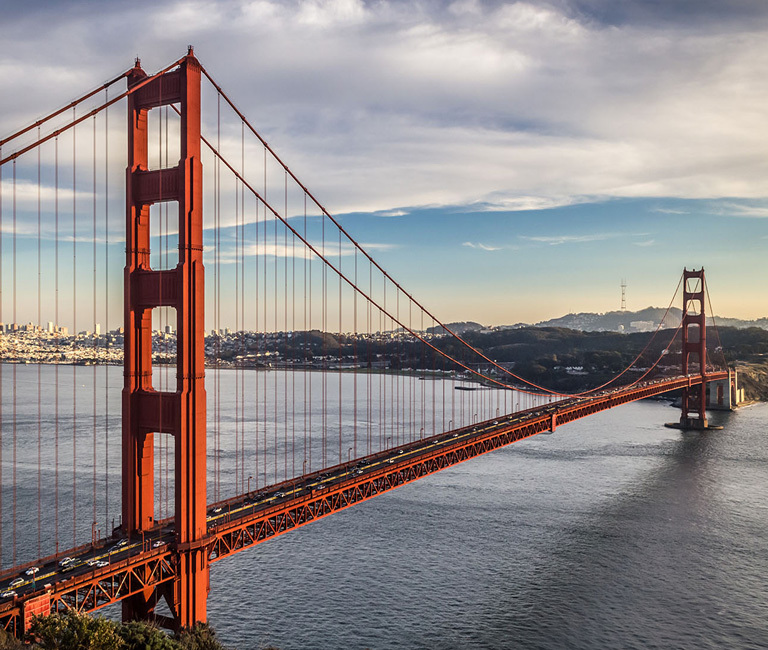 If you fail to cancel outside of this window of 2 days, and try to make and changes or cancel within 2 days prior to arrival date, you will be charged a Cancellation Fee of 1 full night plus taxes and fees. Early Check-Out Policy: You have the option to change your check out date at the time of check-in; however, in the event you decide to check out prior to your confirmed departure date that you gave at the time of check-in, you will be charged an early check-out fee in the amount equal to the applicable rate and taxes you were quoted for all of the days remaining on your reservation. Credit cards are pre-authorized prior to arrival. The Hotel is not responsible for guaranteeing the reservation if an invalid or expired credit card is provided. 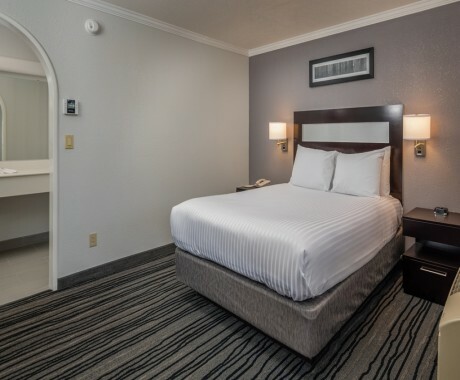 The Standard Queen Bedroom offers comfortable accommodations with a Queen Sized Bed perfect for couples. The air-conditioned Queen Bedroom offers a microwave and refrigerator, coffee maker with premium coffee, radio alarm clock, and iron and ironing board. 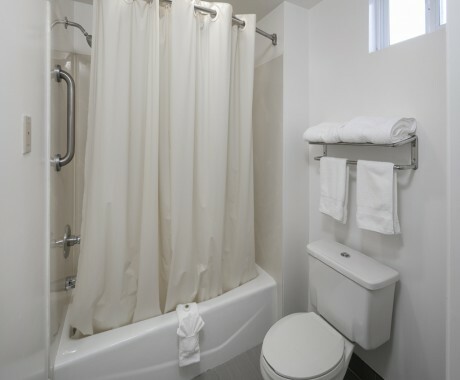 Each room offers a full bath with hairdryer and complimentary toiletries. Free WIFI access is available from every room. 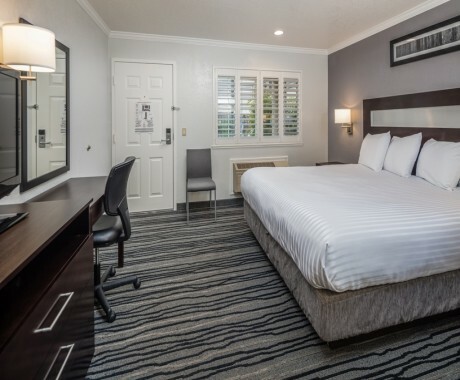 The Standard King Bedroom offers spacious accommodations with a California King Sized Bed perfect for couples. 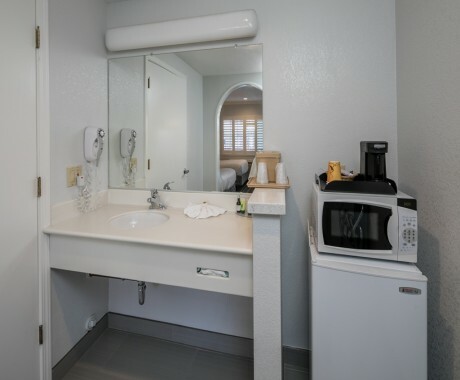 The air-conditioned Standard King room offers a microwave and refrigerator, coffee maker with premium coffee, radio alarm clock, and iron and ironing board. Each room offers a full bath with hairdryer and complimentary toiletries. The 2 Double Bedroom offers comfortable accommodations with two double beds perfect for friends or family. The air-conditioned 2 Double Bedroom offers a microwave and refrigerator, coffee maker with premium coffee, radio alarm clock, and iron and ironing board. Each room offers a full bath with hairdryer and complimentary toiletries. Free WIFI access is available from every room. 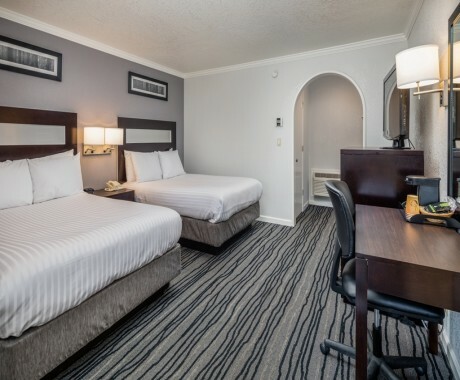 The Accessible Double Bedroom is a service animal-friendly, non-smoking room that is configured for accessibility and comfort of up to 2 adults. 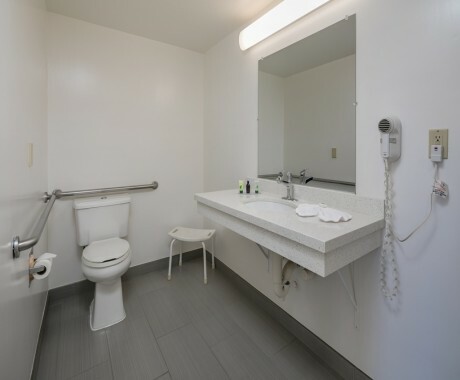 This room is wheelchair accessible and features a spacious bathroom with hand-rails in the shower and a raised toilet seat with grab bars to assist with mobility. 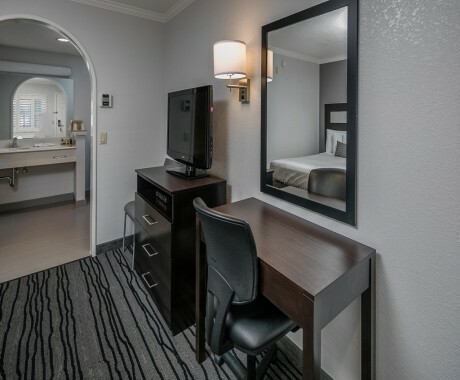 For your added comfort, this room is equipped with Free WiFi, a microwave and refrigerator, coffee maker with premium coffee, radio alarm clock, and lower level counters, lower level iron and ironing board, lowered mirrors, a hairdryer, and complimentary toiletries. Designated accessible parking is available directly in front of this room for your convenience. 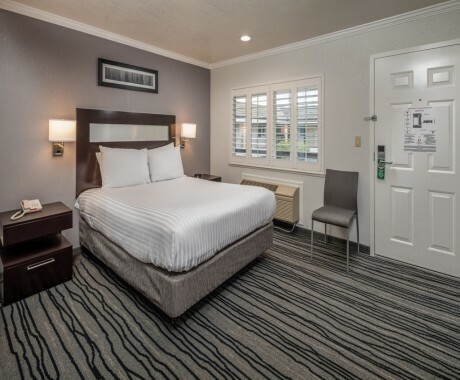 The Accessible One Queen, One Twin Bedroom is a service animal-friendly, non-smoking room that is configured for accessibility and comfort of up to three adults. 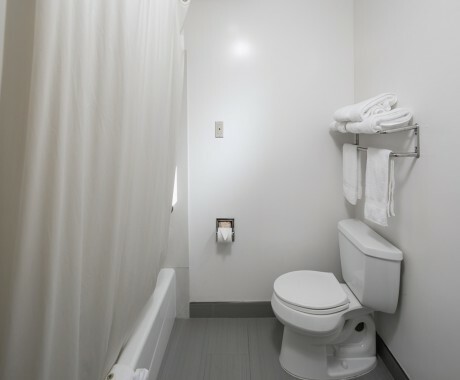 This room is wheelchair accessible and features a spacious bathroom with hand-rails in the shower and a raised toilet seat with grab bars to assist with mobility. For your added comfort, this room is equipped with Free WiFi, a microwave and refrigerator, coffee maker with premium coffee, radio alarm clock, and lower level counters, lower level iron and ironing board, lowered mirrors, a hairdryer, and complimentary toiletries. Designated accessible parking is available directly in front of this room for your convenience.